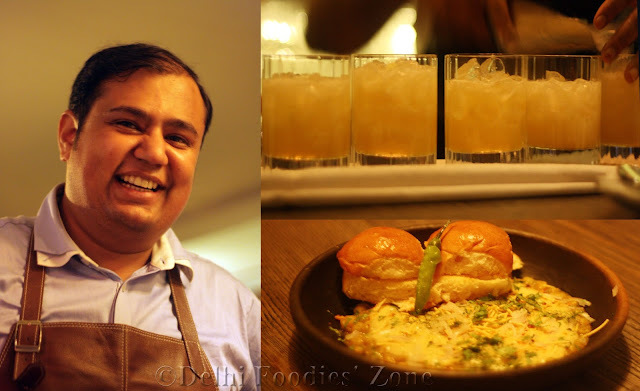 Delhi has a new bar dedicated to the drinking culture of India and Skeety visited to get a feel. 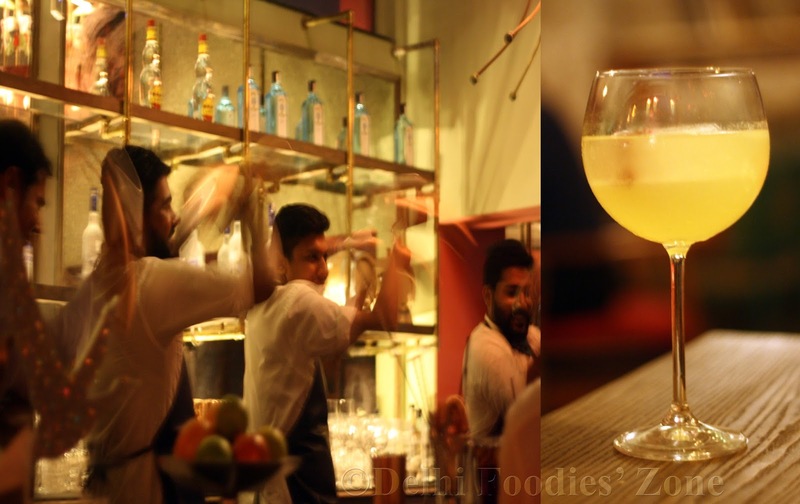 It is kitschy, it is sassy and it is a neighbourhood bar called Ek Bar by AD Singh of Olive in partnership with the very talented Chef Sujan Sarkar. Ek Bar is located in Defence Colony and the place gives a carnival-like vibe with a giant merry-go-round installation just above the bar. One walks in at Ek Bar to witness eager bartenders doing their shaking jig and that sets the tone for the evening. All drinks have an Indian touch. 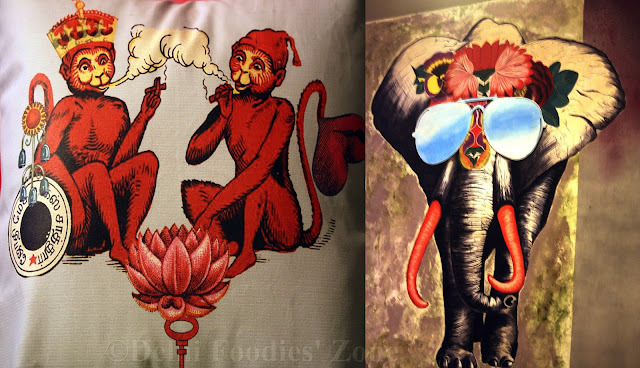 They are re-imagined in the Indian way. You can sample, murabba, amrak (starfruit), gondhoraj lime, Indian spices and such in your drink. The names of the drinks are quirky and Indian: Murabba Mule, Platform @ CST, Sher Singh, Susegad and more. At Ek Bar you decide what mood you are in and pick a card (menu) accordingly. There’s A,K,Q andJ. Choose your drink and get going. The bartender who came with Skeety’s drinks had a story to tell with each of them, making the experience superlative. Our welcome drink was the Royal Indian touch. Nitin Tewari, Skeeter’s bartender for the evening told ‘Punch’ is derived from the Sanskrit word which means five and was first made in India in the 16th century using five ingredients: alcohol, sugar, lemon, water, and tea or spices. When Britishers came to India they enjoyed the drink and took it back to their homeland from where it became popular globally. At Ek Bar, this Punch is served in an intricate teapot that comes with cups to depict the community drinking culture in India. The Mo’g’ito 6 is Ek Bar’s take on a mojito. In India, most pronounce it wrong and hence it is deliberately misspelt at Ek Bar. The story behind the drink goes thus: If Mojito was made in India, it would have our local citrus fruit Amrak or starfruit. And Amrak is sold in Old Delhi during winters, so the bartenders added 6 spices to this drink that they procured from Khari Baoli spice market in Old Delhi. This drink could do with less ice, though! All drinks are claimed to be made within two minutes and the ingredients like shrubs, bitters, juices are all homemade. 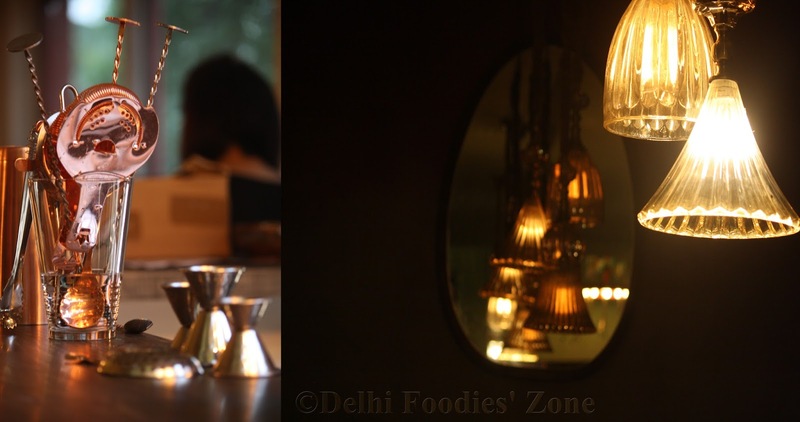 The City of Nizams is gin & tonic, done the Indian way. This bright yellow hued drink comes with Gin, turmeric, orange syrup and tonic water. While fancy icecubes may be the way the world is going, at Ek Bar, this drink had Katori shaped ice in it and inside the icecube was a blade of mace. As Skeety sipped her drink slowly, the mace broke out of ice to lend a hint of added flavour. The Ek Bar Granola Bar is joyous. It is made of Jhalmuri, Avocado and imli gel with frozen Dahi Bhalla ice-cream on the side. This one sets your mouth on fire and Skeeter would go back just for this. It goes very well with alcoholic and non-alcoholic drinks. Fresh local Burrata comes seated on a bed of tomato kut and is topped with a coriander and walnut chutney crumble. The freshness of the Burrata is stunning and the tart-sweet tomato kut beneath only adds to it. 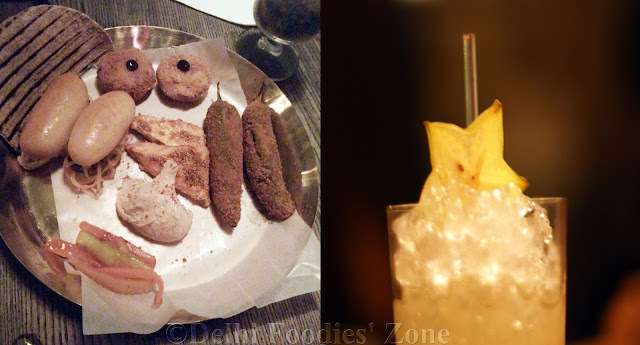 What is really good about Ek Bar is that they have engineered the menu that is full of nibbles and finger food. Skeety always wanted a place where she can just snack, drink and be happy and Ek Bar is just that. The Veg Thali is just a name. It is essentially appetizers put together to form the Thali components. In the Thali, mushroom galouti hot dog was innovative, beetroot and peanut coin was okay, ricotta stuffed bhavnagiri mirchi packed the punch, rawa fried paneer was different from the tikkas that the vegetarians are dumped with, rajma hummus was fresh and creamy and the charred roti made a perfect accompaniment. They have a cheese Thali too and Skeets would want to go back and try that some day. End your meal on a sweet note with some carrot halwa cake and savoury buttermilk icecream. This combination was delightful and reminded Skeeter of her garam halwa-thandi malai winter eating ritual. Where: Ek Bar, D-17, Defence Colony (corner building near petrol pump). Note: The place opens for public on September 23rd. This was a preview on invite.